With shun's incredibly sharp, clean edge, there is no need for serrations in your steak knife. The knife simply glides through your steak effortlessly. The clean cut helps ensure your steak loses less juice and keeps the juicy flavor where it belongs-in the steak and in your mouth. And the gorgeous looks of the premier steak knife is practically guaranteed to enhance your dining experience. Elegant and beautiful, the shun premier line of knives is unlike any knives you've owned. 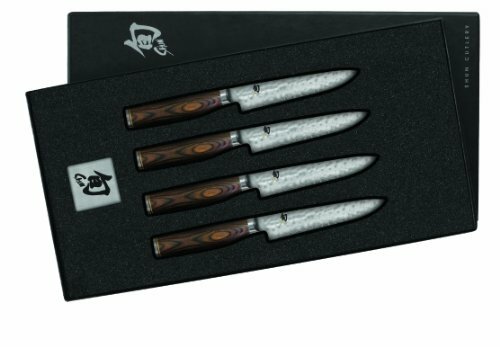 Featuring layered damascus steel for strength, the hand-hammered finish (known as 'tsuchime' in Japanese) lends not only to the beauty, but creates the hollow-ground feature that reduces knife-drag and prevents food from sticking to the blade. Ultra-thin and incredibly sharp, these blades feature a 16-degree blade angle making the blade flexible, but much sharper than traditional western knives. The gorgeous Packwood handles in walnut finish are both sleek and stylish, and are shaped to fit the palm of your hand in a variety of secure and comfortable grips. The shun logo is embossed on the end cap, making these knives beautiful in and out of the knife block. Incredibly thin, sharp blades, stylish finishing details and created in the Japanese styling that shun is famous for; you know your premier of knives will work just as hard as you do in your kitchen, and be around for generations to come. Hand washing only; limited lifetime warranty.